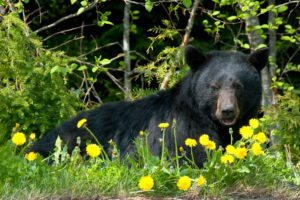 The most common bears are the American black bear. Although named black, they can be various shades of black, white and brown. 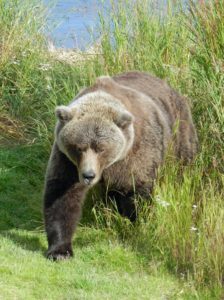 These bears inhabit most of the forests of Alaska with the exception of the Seward Peninsula, the Yukon-Kuskokwim Delta and north of the Brooks Range. These bears are the smallest of the North American bears. An average adult male weighs about 180 to 200 pounds. Black bears are physically distinguishable from brown bears in that they have no shoulder hump, they have smaller, dark colored claws, bigger ears, and a flatter sloping brow line. Brown bears live in every part of Alaska except certain islands. They are also commonly referred to as a grizzly bear. While these bears predominantly feed off a diet of plants and berries, those that live in coastal areas tend to be much larger due to a diet high in salmon and other fish. Brown bears are larger than black bears with an adult male weighing 300 to 650 pounds. Grizzlies have well-developed shoulder muscles for digging and turning over rocks which create a very distinctive should hump. They have smaller ears than the black bear, but light colored very long claws. 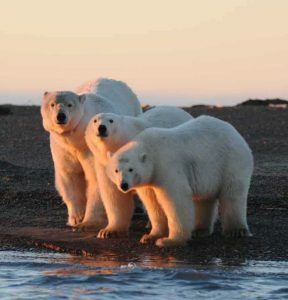 Polar Bears live in the pack ice and tundra of extreme northern and western Alaska. They are a carnivorous bear whose chief food source is the seal. Although related to the brown bear, the Polar bear has adapted to its arctic environment. Polar bears are insulated with two layers of fur and a thick layer of fat that keeps them super warm. In fact, polar bears have more problems from overheating that they do from the cold – especially when they run! Polar bears are very large. An adult male can weigh anywhere from 350 to more than 1300 pounds! Bears are not nearly as unpredictable and dangerous as Hollywood would like us to believe. They are normally shy, retiring animals who prefer to avoid human interaction. Attacks are quite rare. Bears, like many humans, have their own personal space – an area around them that they may defend. Once you have entered a bear’s personal space, you force the bear to act – either to run away or be aggressive. If you do encounter a bear at close distance, remain calm. Talk to the bear in a normal tone of voice and wave your arms so they can identify you as human. Do not run – back away slowly. Avoid eye contact.